Fred made some good progress over the last few weeks, clearing the decks for some more visual novel work. The biggest thing Fred worked on was finishing part 1 of the Endgames:Persistence omake. 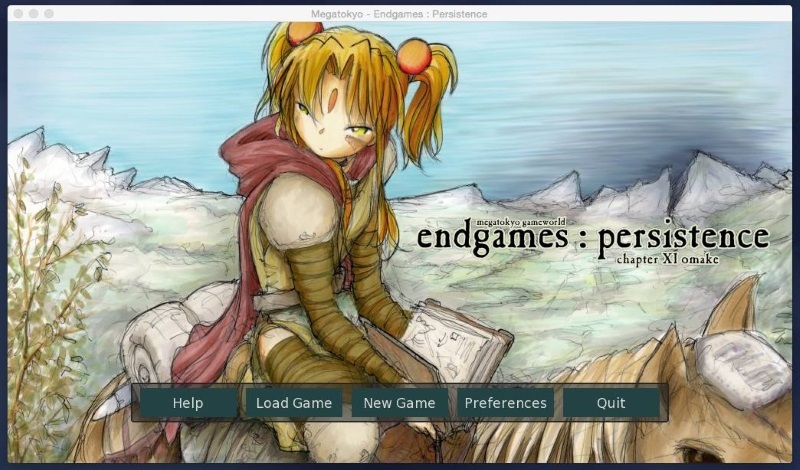 You can download the omake game via torrent using the links in Fred’s rant, or play an almost-as-good version straight in your browser from the Megatokyo site. 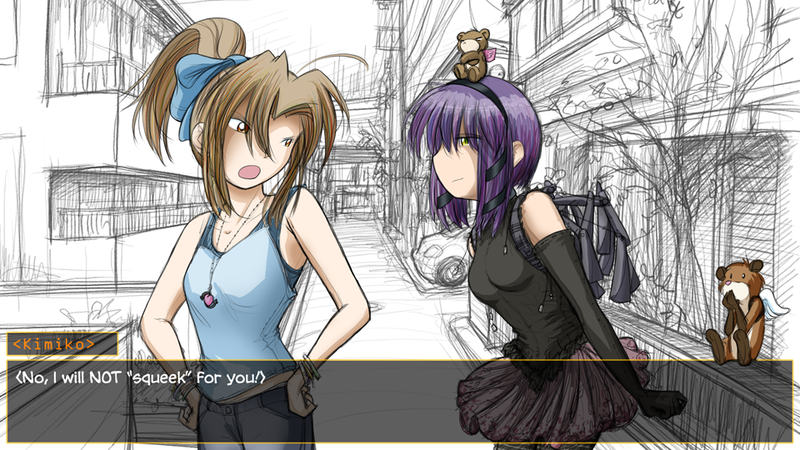 The omake is built using many of the techniques and work that we have developed for the visual novel itself. It looks really good. We had a recent scare where the downloadable version of the omake was getting flagged by some antivirus programs. Fortunately this turned out to be a false positive, where the antivirus mistook the game icon picture for a virus. We have removed that icon from the program, so if your antivirus was triggering on the old version, you can download the new and it shouldn’t have that problem. Many thanks to Java, Shadow, and VirusTotal for diagnosing the problem. 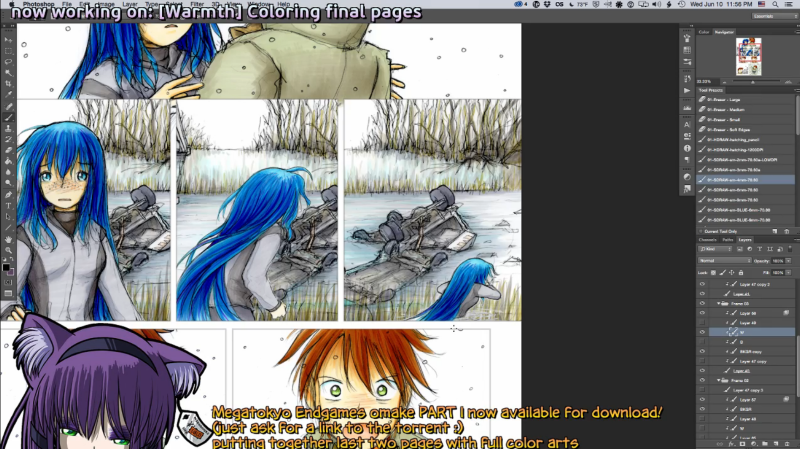 Fred also finished coloring and cleaning up the last few pages of the first installment of Warmth. It looks great, and it’s nice to finally get that finished. With those two major projects at a good point, Fred got back to work on the visual novel. Above you can see the CG event for when Kimiko hits Piro with the coffee pot. Fred is planning to do a lot of finishing and cleanup to the early part of the visual novel over the next few weeks. 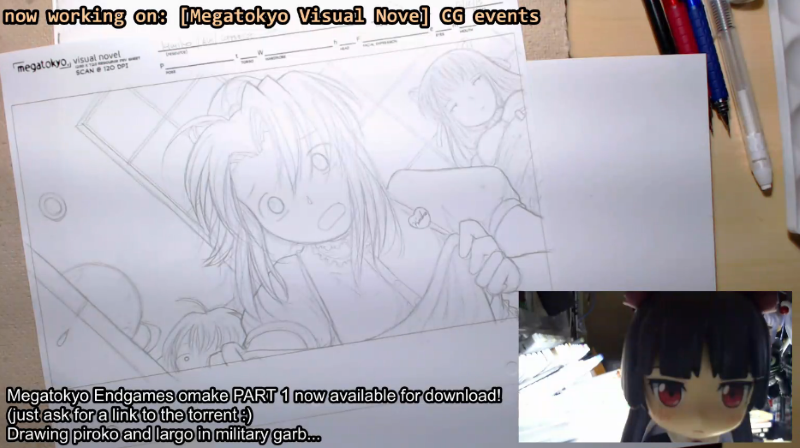 You can watch a lot of this drawing work live by tuning in to Fred’s livedraws on Twitch. We are still planning to put out a preview version of the MT visual novel for the 2nd anniversary of the kickstarter in july. It will be available to everyone who pledged beta tester level and up. The visual novel is still progressing, though much slower than we would all like. It’s a long way from done, but we think you’ll like what we have so far. Thank you for your support and for your patience. This entry was posted in Visual Novel on June 14, 2015 by paarfi.